Massachusetts - Msgr. 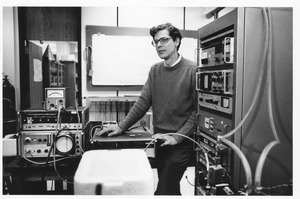 David J. Power receiving honorary doctor of humane letters degree at class of 1974 commmencement. 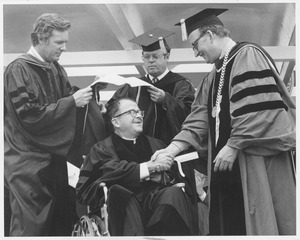 He is seated in a wheelchair, wearing an academic gown, shaking hands with President Robert C. Wood in academic regalia. Two unidentified men are behind him holding his hood above his head about to put it on him. 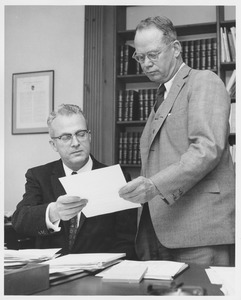 Massachusetts - UMass President John W. Lederle (seated) and Dr. Lamar Soutter, Dean of the University of Massachusetts Medical School, examine a paper while at a desk strewn with other papers. The Medical School was established during President Lederle's term in office and Dr. Soutter, as its first Dean, selected the faculty to help shape the new School. 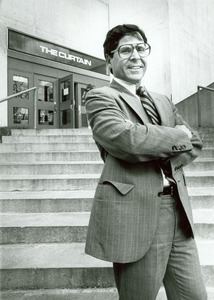 Massachusetts - Portrait of Schwartz, 3/4 length, 3/4 profile, smiling, arms folded, standing in front of Fine Arts Center. 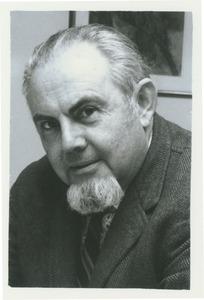 Copy of news release in folder dated February 7, 1983 indicates that Schwartz would become Dean of the Faculty of Humanities and Fine Arts and join the faculty as an English professor effective July 1. 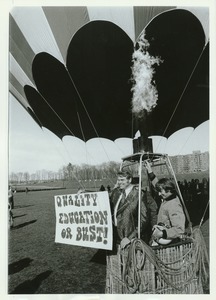 Massachusetts - Dwight W. Allen, Dean of the College of Education, holds a sign reading "Quality education or bust!" while standing in a hot-air balloon basket with its pilot. Several onlookers stand by and the Southwest dormitories can be seen in the background. This event was held during a School of Education Marathon. 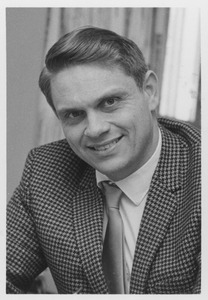 "Dean Allen, Public Higher Education" written on back. 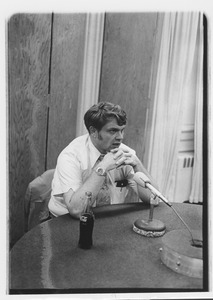 Massachusetts - Dwight W. Allen, Dean of the College of Education, speaks into a microphone as he rests both elbows on a table, fingers entwined. His jacket is draped over the back of his chair and a soft drink bottle sits nearby. "Dwight Allen" handwritten on back. 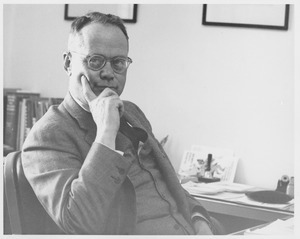 Massachusetts - Informal portrait of Dean Jeremiah T. Allen, Professor of English, Associate Provost and Dean or Acting Dean of various departments. Typewritten note on back reads "1977-78". 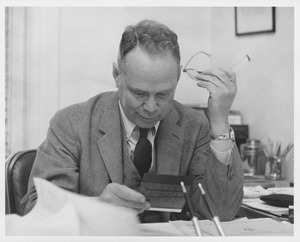 Massachusetts - Informal portrait of Dwight W. Allen, Dean of the College of Education. "Dwight W. Allen, University of Massachusetts, Amherst" handwritten on back. A red star within a red circle and "Oct 21 1972" are stamped on back.